In golf, there are two kinds of chippers. 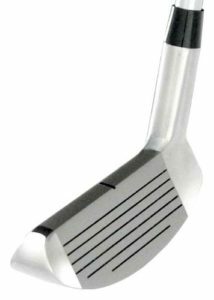 One is a specially designed club for folks who need extra help with shots from just off the green. The other is a big honking piece of dangerous machinery that takes in whole branches and spits out a pile of mulch on the other end. 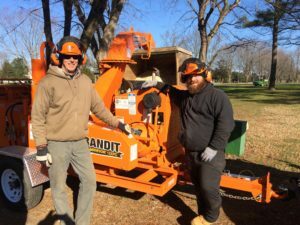 In the last few weeks, course superintendent Mark Nauman, staffer Carl Owens, and others have been using a Bandit Intimidator wood chipper while removing trees and branches from the Rookery North golf course. The other kind of chipper, with Mark Nauman (l) and Carl Owens (r). “So far we’ve taken out thirty trees completely, and trimmed off at least a dozen more,” Nauman said in a recent interview. The most visually stunning changes thus far are at the long par-3 10thhole, where tall oaks and maples crowded in from the right and left side of the approach. If your tee shots were draws or hooks, either high or low, it was nearly impossible to reach the green. The canopies of the large trees blocked the way, and often knocked down what had looked like promising shots. Six of those trees are gone, and their absence created a different perspective from the tee box. As co-owner Chris Adkins and Nauman both said, the green from 197 yards away looks further away than it did before. Perhaps those trees collapsed the visual perspective. 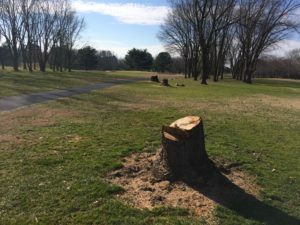 The tenth is still one of the hardest par three holes in Sussex County, but cutting down those trees gave more golfers a fighting chance to make par. Other tree removals also made a lot of sense, both from a playability and turf health perspective. Several trees were removed behind the seventh tee, again with the goal of eliminating the competition for light and air that the turf always lost. Five pine trees adjacent to the right side fairway bunker on that hole are also gone, in a spot where there always appeared to be more pine needles than grass. Four trees adjacent to the little creek that separates the tee boxes on the par 3 thirteenth have been marked for removal. These trees can make this hole feel like a dogleg left when hitting from the back tees, which isn’t supposed to happen on a par 3. The eighteenth hole at Rookery North is a 431-yard par 4. It is actually the hardest hole on the golf course from the white or blue tees. A long series of trees stand sentry on the left and right side of the fairway, and present a significant challenge to golfers whose tee shots drift to the right. The overhanging branches on some of these trees block otherwise routine long iron or hybrid approaches to the green from the right side fairway. Adkins was clearly a little wistful at the loss of some of these trees, several of which were planted when the first nine holes were built sixty years ago. 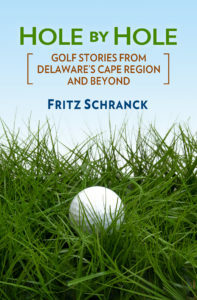 However, he knows that while many golfers like to see trees, they play their game on grass.